It started with a drive down Magnolia Lane. It ended with a trip down memory lane. The Masters Tournament is always a special time of the year for Jack Nicklaus—with that whole six Green Jackets thing and all—but the 80th Masters just had something special about it. And there was no time wasted to sensing it, beginning with the Golden Bear’s drive down iconic Magnolia Lane to enter Augusta National Golf Club. “Had I realized he was filming me, I might not have been so nice,” Nicklaus said with a wink and tongue firmly planted in cheek. After an hour-long press conference, it was off to the Champions Dinner where Spieth, the 2015 Masters winner, did in fact select an authentic Texas barbeque menu—a nod to his native state. Nicklaus sat between four-time Masters champions Tiger Woods and Arnold Palmer. While Nicklaus was about to wrap up the Champions Dinner, his fans and many in the golf world had the chance to enjoy the premiere of Golf Channel’s highly anticipated original documentary, ’86. The hour-long retrospective celebrated the 30th anniversary of the Golden Bear’s iconic 1986 Masters win with behind-the-scenes anecdotes—such as Jack’s decision to wear yellow on Sunday, because it was the favorite and lucky color of a friend and child, Craig Smith, who had passed away 15 years earlier from cancer—and compelling stories gathered from over 75 interviews conducted by Producer Israel “Izzy” DeHerrera and his award-winning team. As one of many fans who wrote Jack after the documentary aired said, “I am watching ’86 for the 5th time since I discovered it a week ago on Golf Channel. Every time the part about Craig Claxton Smith (may he be Resting Happily In Peace) comes on, I lose my composure. Listening to Jack Nicklaus describe his experience at the ’86 Masters—I’ve been telling everyone I know about this documentary—I cannot say enough about it. “Everyone who contributes to the recounting of what happened—everyone—there’s such animation in their voices…. 30 years on. I didn’t know the entire story before I happened upon ’86. I get chills thinking about how monumental it was that ‘The Golden Bear’ won The Masters in 1986 with a back nine on Sunday that is clearly and literally a stretch of golf for The Ages. “I’m not one to weigh in about too much, but I just had to say thank you for being such an inspiration, and for being a positive inspiration on so many levels to so many people worldwide. Wednesday at the Masters, the Golden Bear balanced a gauntlet of live interviews—Mike and Mike on ESPN Radio, The Dan Patrick Show on NBC Sports, Steve Sands on Golf Channel, and Hannah Storm on ESPN—with visits to see friends and partners, such as Rolex. At the Rolex cabin, you could find in one hour Annika Sorenstam, Tom Watson, world No. 1 Lydia Ko, Adam Scott, and David Leadbetter. Then, Nicklaus teed off ESPN’s coverage of the popular Masters Par 3 Contest with playing partners and good friends Tom Watson and Gary Player. Nicklaus had his first-ever caddie duet of grandchildren Will Nicklaus and Kelly O’Leary on the bag. And although he didn’t follow up last year’s hole-in-one in the Par 3 Contest with another this year, the Golden Bear was there to support three-time Masters winner Gary Player with his 31st hole-in-one. 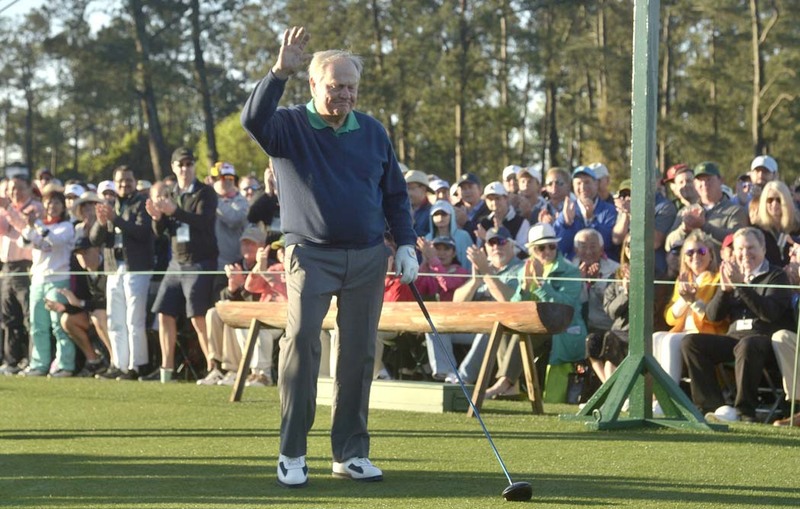 Thursday morning, Nicklaus was back with Palmer and Player on the first tee to get the 80th Masters Tournament underway as an Honorary Starter. Nicklaus and Player competed in a friendly long drive competition, while Palmer greeted the adoring crowd and cheered on his pals. Although Nicklaus has been an honorary starter in the event since 2010, participating in the tradition this year moved the Golden Bear to tears. At the tournament’s conclusion—and after various CBS Specials aired Saturday and Sunday to pay tribute to the Golden Bear—Nicklaus offered words of encouragement and understanding to Spieth, who led the Masters through 65 holes before a quadruple-bogey 7 on the infamous par-3 12th hole derailed him and led to a second-place finish. The Golden Bear wasted no time to offer heartfelt congratulations to 2016 Masters winner Danny Willett.